Add water and boil for a few hours. Just drink the boiled water. Do not use ‘cooling’ vegetables like kangkung or long beans. 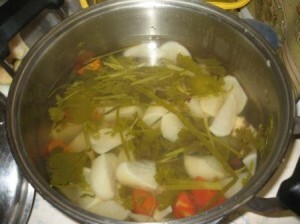 When you feel tired or suspect that you are not taking sufficient nutrition, try to boil the soup to drink. They learned it from yogis who practices ayurveda.